Hot tearing occurs primarily in the casting mold and can be attributed to thermally induced tensile stresses which occur as the molten metal cools and begins to contract. There are a number of studies available which investigate the behavior and effects of hot tearing but the prevention of this phenomenon is not so simple. Hot tearing is the undesired formation of irregular cracks in metal castings that develop during solidification and cooling; typically while the casting is still inside the mold or die cavity. The cause of hot tearing is generally attributed to the development of thermally induced tensile stresses and strains in a casting as the molten metal contracts during solidification and solid state shrinkage. Hot tearing often occurs at the inside corners or fillets of casting geometries, where casting shrinkage is constrained by the relatively rigid mold cavity. In die casting, the mold cavity is a comparatively rigid structure (usually steel), in comparison to the relatively low strength aluminum, magnesium or zinc casting alloys at high temperature. One of the key “castability” attributes considered in the development of new metal casting alloys is a low propensity for hot tearing. In addition to casting design features, factors that influence hot tearing include both the casting alloy (chemical composition and solidification characteristics), and casting process parameters. Therefore, hot tearing tends to be of greater concern in die casting processes, compared to sand casting processes where the mold cavity is typically lower in strength, and more compliant to casting shrinkage. 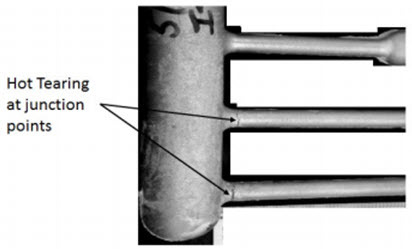 Hot tearing cracks can be seen via in Constrained Rod Casting (CRC) shown in Figure 1. Also, hot tearing defects have been investigated in the continuous casting of steel and aluminum ingots. The rapid cooling processes cause higher thermal gradients that led to thermal contraction in the ingots, which result in hot tears as shown Figure 2. This ranking of these wrought aluminum alloys agrees well with observations in typical industrial casting practice. The ranking of the binary alloys is in agreement with foundry practice and previous investigations. The CRC method and the HTS index are able to distinguish the hot-tearing sensitivity of alloys with and without grain refinement. The microstructural investigation of the grain-refined and non-grain refined AA1050 alloy showed an inverse relationship between the degree of grain refinement and the hot tearing tendency. The experimental results also show that grain refinement dramatically reduced the hot tearing susceptibility of the alloys exhibiting lower hot tearing tendencies, i.e. AA1050, AA5182, and AA3104. However, grain refinement was not very effective in AA6111, which is an alloy exhibiting higher hot tearing tendency, despite the fact that the grains were fine and equiaxed. This may be explained partly by the fact that this alloy inherently yields a fine grain size. Work of R.Sharma, R.Tyagi, N.Yadav et R.Goel is based on investigating the effect of grain refiners added in different weight percentages to the aluminum copper silicon alloy on the formation of heat tears. The alloy was prepared subsequently followed by addition of grain refiner and varying the mould temperature. A permanent mould was prepared and the molten alloy with the added grain refiner was poured and allowed to solidify. The formation of hot tears under different process parameters of aluminum copper silicon sand cast aluminum alloy was observed in the enlarged views. It was observed that the grain refiner and mould temperature reduced the hot tear tendency in Al-Si-Cu alloys. This research suggests that grain refiner and mould temperature reduced the hot tear tendency in Al-Si-Cu alloys. However the study also shows that grain refiner additions are alone not sufficient and can produce a poisoning effect in the presence of silicon. 1. The hot tear in every case came at the junction of bottom sprue and casting bar. 2. Al-5Ti-1B grain refiner restricts the grain growth of aluminum particles and refines the grains of Al-Si-Cu alloys. 3. Grain refiners provides nucleating sites in the form of TiAl3 and TiB2 particles as seen in XRD analysis. 4. Grain refiners alone are not sufficient for grain refinement. Initially, for the 0.2, 0.4 and 0.6wt.% addition of grain refiners the hot tear tendency decreased, but when there was an addition of 1 wt.% grain refiners, the hot tear tendency again increased. This demonstrates the poisoning effect of grain refiners in the presence of silicon.